You might find this article interesting if you’re curious how the chi-Squared tests (such as goodness-of-fit) really work, but don’t feel you have the mathematical background to tackle the linear algebra that is involved with proving how they work. Instead of mathematical derivations, I’ll try to explain the tests through graphs and diagrams, so that you can gain some intuitions about what is going on inside the chi-squared tests. If you feel comfortable with more advanced mathematical concepts such as vectors and matrices (linear algebra) you might find my other post here more succinct/precise. One of the reasons I wrote this was a realisation that there isn’t (as far as I could find) another post out there that really conveys the workings of the test (correctly) without fairly complicated maths. There are a few sites out there that try to simplify it, but they get it quite far wrong (by the end of this, I hope you’ll have the intuitions to see that they are indeed wrong). And wrong intuitions lead to people using the test in ways that simply don’t work, and I have seen this in my job many, many times. 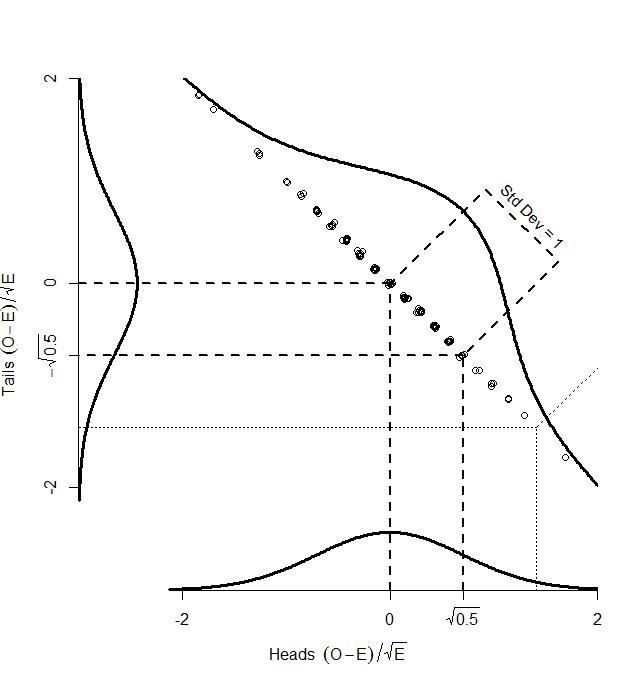 To develop these intuitions, I’ll also need to introduce the chi-squared distribution. 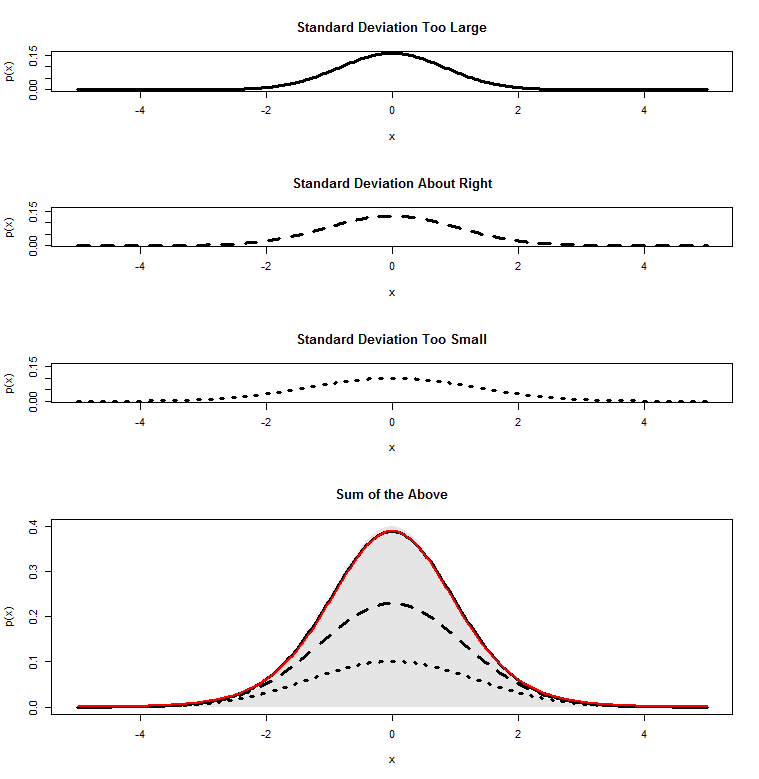 You might think this distribution is only really useful for chi-squared tests, but actually, the chi-squared distribution underlies almost every single parametric test that you will meet in an introductory stats course (t-tests, ANOVA, linear regression, ANCOVA, polynomial regression, all derive their p-values by means of chi-squared distributions) and the intuitions we’ll develop here can be extended to allow you to understand how these tests really work, in a much cleaner, more obvious way. In turn that will give you a clear understanding of concepts such as degrees of freedom, and type-I sums of squares, and how all the first parametric tests you learn are effectively the same test, rebadged. I will write a post on this, when I get the chance. But, for today, chi-squared, and in particular, the goodness-of-fit test. (The test for association is just an extension to this, but is a good deal harder to visualise). 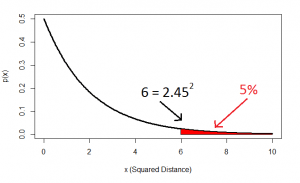 You might gather, looking at the rest of this blog, that I have a small fascination for the chi-squared test. I find it fascinating that this test is so outwardly simple, so simple that it is often the first hypothesis test that a student will be taught, but whose workings under-the-bonnet are far more complicated than they seem to appear. It leaves us with this enigmatic formula that doesn’t seem to make much sense unless we can interrogate it with some relatively complex maths (certainly beyond the scope of many users of statistics). Now, this makes things much easier, because we know exactly what sort of z-scores are “usual”, and what sort of z-scores are more unusual. For example, 95% of all z-scores will lie between (around) -2 and +2. Those that are outside of those bounds, we very often consider “unusual”. Those between -1 and +1 are the most common. How do we calculate that distance? Good old Pythagoras theorem! 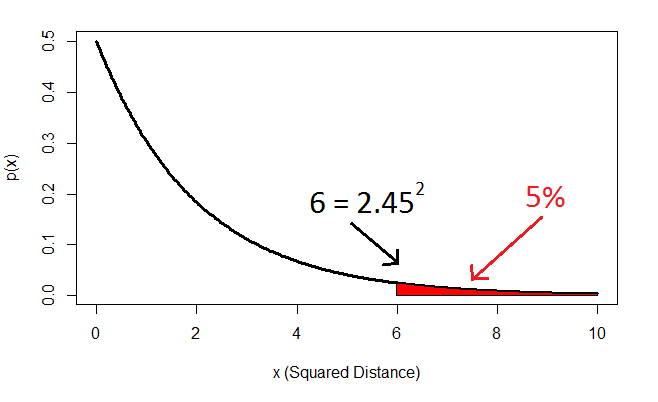 If we square the height of a given person, square their intelligence score, and add those two squares, we get the square of the distance from the centre to their point on the graph. …and this confirms that, indeed, 5% of datapoints will lie at a squared distance greater than 6 (or an unsquared distance of 2.45). …and we can again calculate how “unusual” a particular combination of values is by finding the squared distance from the centre. This is calculated by an extension of Pythagoras (“Euclidean distance”), again by summing up the three squared individual values, and comparing to a chi-squared distribution with three degrees of freedom. We can go on like this into as many dimensions as we want, the same always holds. And the degrees of freedom of the chi-squared distribution just represents the number of independent normal distributions we are combining. First things first, let’s make sure we have a definition of the goodness-of-fit test that is actually correct. 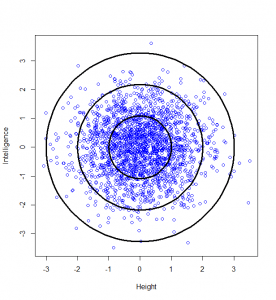 The most common definition that I have seen is that it is a “test for count data”. While there is a kernel of truth to that, I have seen far too many instances where that has been misunderstood and the test has been wrongly used. I’ll explore some of those abuses in a later post, and we’ll see why they don’t work, at least without a few modifications to the test. 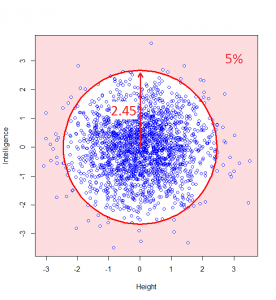 The goodness-of-fit test should instead be thought of as a proportion test. 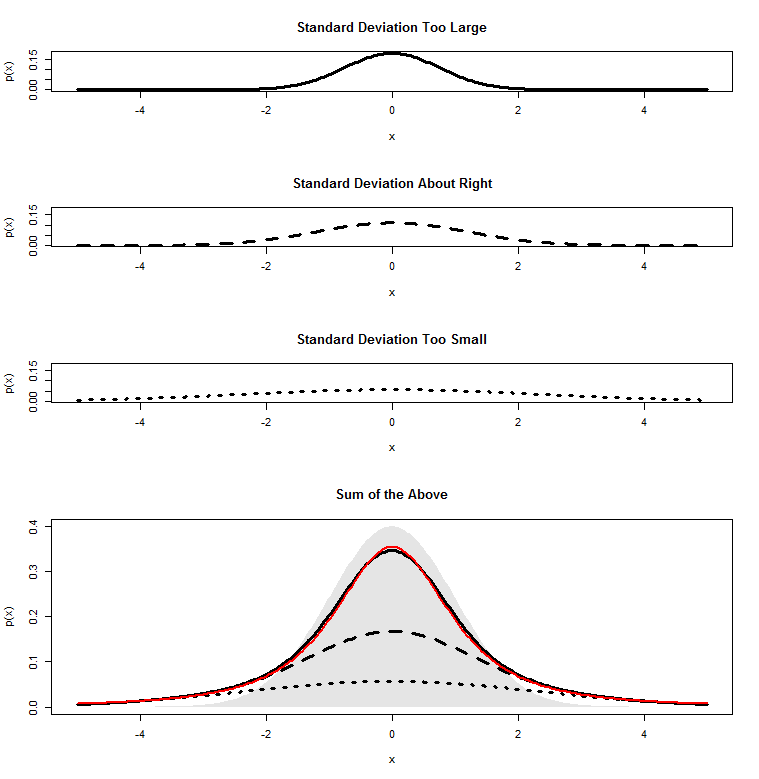 In a later post, I’ll describe how ANOVA generalises a t-test to test more than two means by replacing a normal distribution with a chi-squared distribution; the goodness-of-fit test generalises the proportion test to work on proportions of more than two categories in exactly the same way, as we’ll see. So, it’s a proportion test that can handle more than two categories. where is the number of times we toss our coin and is the probability of getting a head. 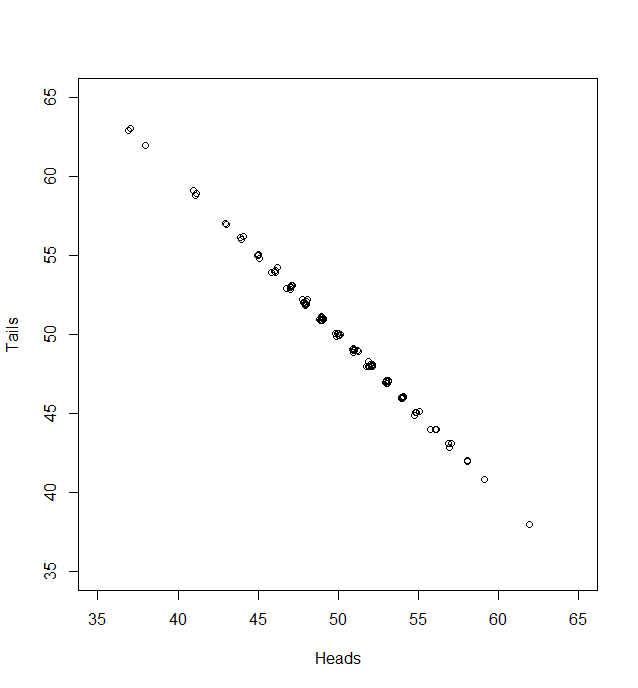 Sometimes we get 55 heads, or 45. It’s not even that unusual that we get 60 or 40 heads. If we got 80 heads, we might start wondering if we really had a fair coin. By comparing our result to this histogram, we can figure out if our result looks like the sort of result we’d get from a fair coin (and, if not, we call our result “statistically significant” and reject our null hypothesis of a fair 50/50 coin). 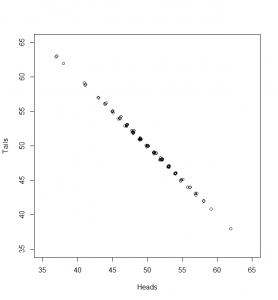 where represents the number of heads we have “observed”. So, we could take the square root of this, and compare it with the standard normal numbers in the back of our book. Or we could not take the square root, and compare it with a chi-square distribution with one degree of freedom (since a chi-square distribution with one degree of freedom is just the square of one standard normal). 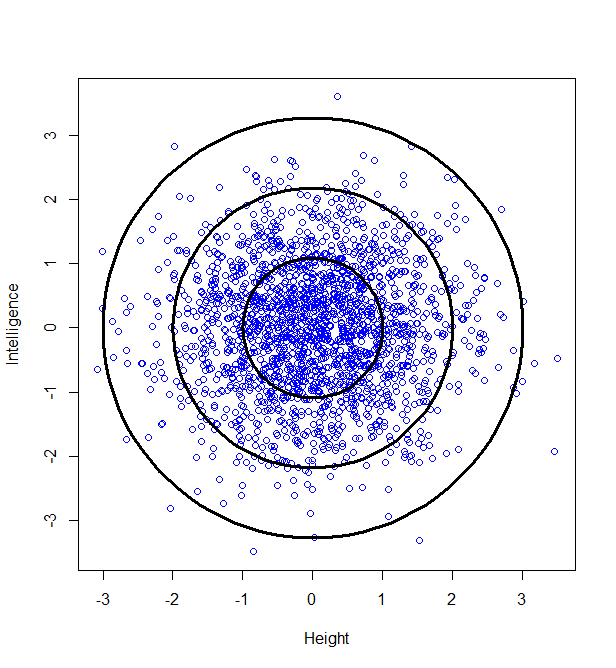 So, the key point here is that, although we have two different observed counts, a scatterplot of them can only scatter away from the centre in one direction — the graph has been squashed flat. That is because we are dealing with proportions, so that if we gain one extra head out of our 100, we must lose a tail. 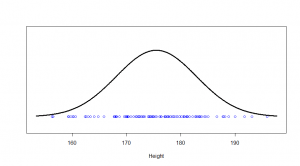 And in the one direction that it can move, it is normally distributed with standard deviation of 1. So, our graph is made up of one single, standard normal distribution, and the squared distances from the centre will be chi-square distributed, with one degree of freedom. Now, that might seem like a lot of hassle compared with the standard proportion test. But the beauty of the goodness-of-fit test is what happens when we have more than two possible categories. 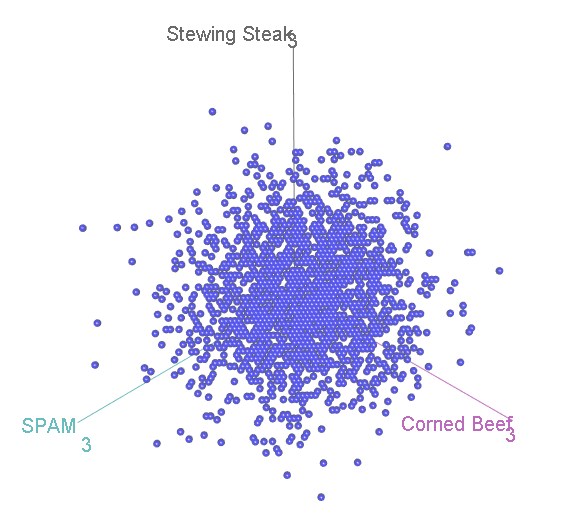 Suppose we ask 99 participants to choose their favourite tinned meat, out of Corned Beef, Stewing Steak, and SPAM. 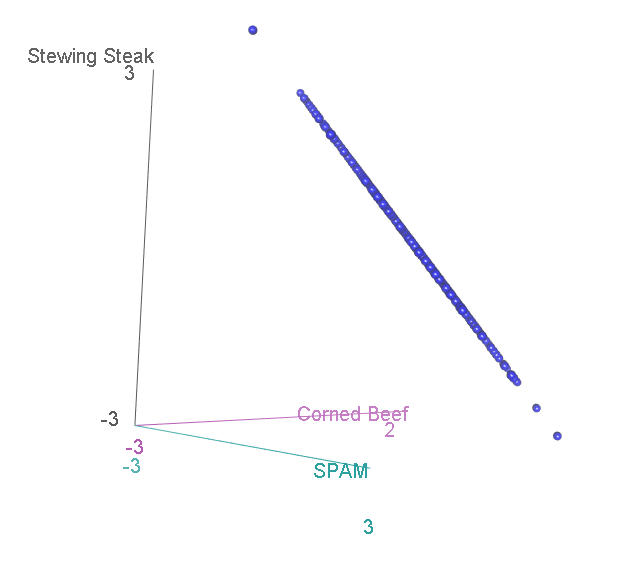 We might hypothesise that none is really better than the other, so we should see an equal proportion of corned beef-, stewing steak- and SPAM-lovers in the population. But we have just 99 participants from this population, and so we can’t necessarily expect that we’ll get exactly 33 of each, since randomness is involved. Perhaps we have 32 corned beef, 32 stewing steak and 35 corned beef lovers. Is that sufficiently different from the expectation of 33 of each to disprove our original, “null”, hypothesis? …Actually, it is distributed in exactly the same way, again floating diagonally across a three-dimensional space. 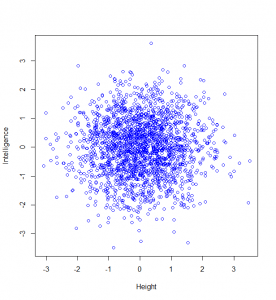 And, remember, we can look for unusual cases in this scatterplot by comparing the squared distance from the centre with two-degree-of-freedom chi-square distribution. The proof that this is distributed in exactly the same way is quite complicated, but it leads to a very simple final solution that shows that this will hold, no matter how many categories we are dealing with. With ten categories, we have nine normal distributions lying diagonally across a ten-dimensional space, and we can compare our squared distances with nine degree of freedom chi-square distribution. This post was really written as a way for me to wrap my head around the shape of the non-central t-distribution and how it fits into power analysis I hope it might help someone else out there, too! My previous two posts establish the foundations for this. 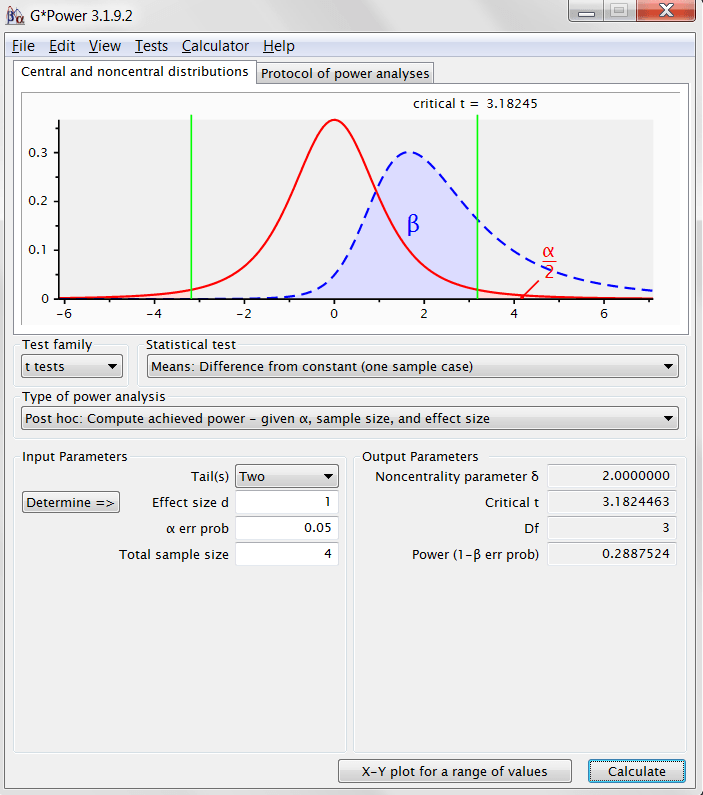 In the first, I showed how sample means tend to be normally distributed, and still normally distributed if we divide them by their population standard deviation; but if we divide them by their sample standard deviation they are t-distributed. In the second, I showed how the -distribution is built up as a pile of normal distributions of different spreads, but with the same mean. I’ll build on these two posts in the following. 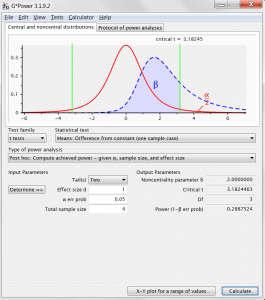 This -distribution then forms a nice basis for testing a null hypothesis. 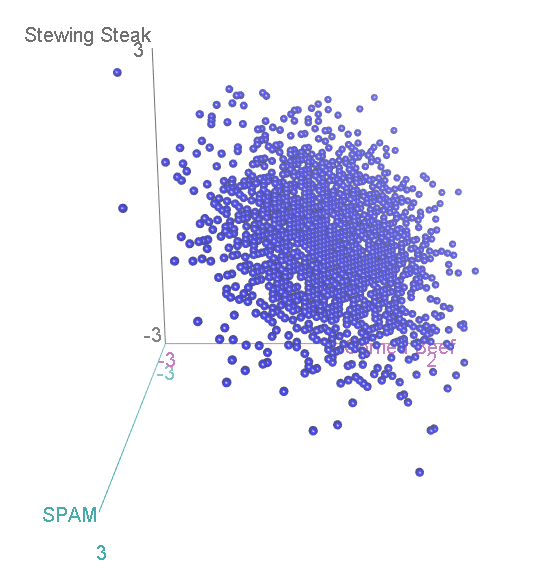 Say we have a sample of size , with mean and standard deviation . If we want to know whether that might have come from a population with zero mean, we can calculate a -statistic as , and see if that looks like the sort of -statistic that we’d expect to get by comparing it against a -distribution with degrees of freedom. If our -statistic is in the outer, say, 5% of what we’d expect from a distribution with zero mean, then we say it looks less likely that our null hypothesis is true, and “reject the null” (etc etc). For example, in my the first of the posts I mention at the start, I look at the example of choosing four numbers between -48 and +48 at random. The raw numbers themselves should have a standard deviation of 28. The mean of your sample of four would, on average, come out at zero, but will miss that by a sampling standard deviation of . Dividing a given mean by this value 14 would convert it into a -score, which could then be compared against a normal distribution. Dividing by its own sample standard deviation would give us a -score which could be compared against a -distribution. The mean of 28 also gets squashed to 1/14th its original size; of course, these don’t look -distributed, since the mean is not zero, but that is the point: half of our -statistics would be above 2, which would give us enough evidence to conclude that our sample is not consistent with one from a null hypothesis of zero mean and standard deviation of 28. So, in this example, we could conclude that we’d have 50% power. 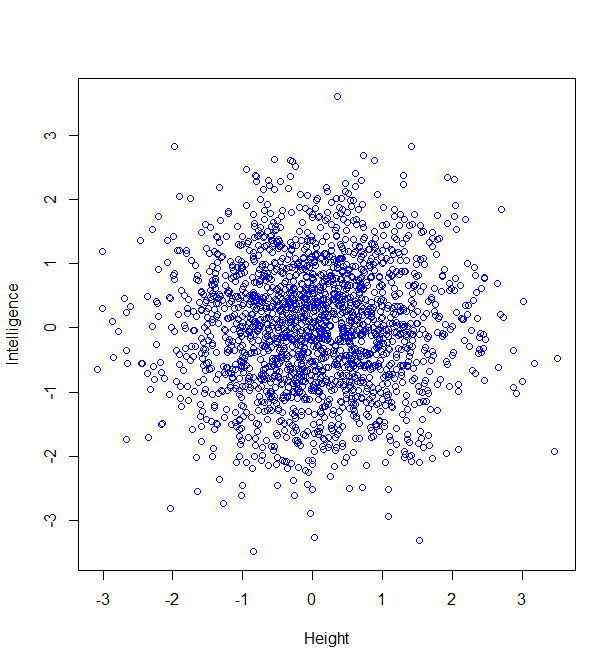 When we’re dividing by a sample standard deviation that is “about right”, the mean of our means does indeed get squashed by a factor 14 and comes out around 2. 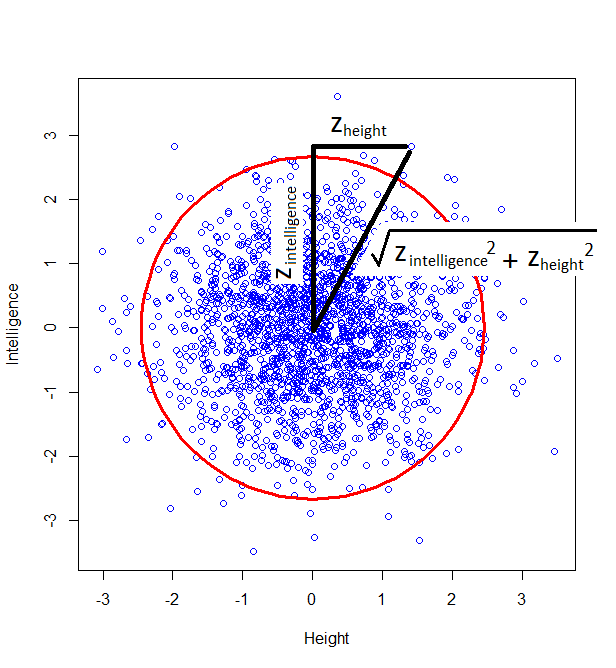 But, when we get a sample standard deviation that is too large, it gets squashed even more, and the whole distribution gets squashed closer to zero, further to the left. Where the sample mean comes out too small, we don’t squash our distribution enough, so we end up spread out further to the right. When we add all these together, we get a skewed distribution. And this is the non-central -distribution. In this case, we have a -distribution with three degrees of freedom a non-centrality parameter of 2, which is the curve I fitted to the above graph. So, we achieve 29% power. Let’s set this up in G*Power to see if this makes some more sense of the numbers that come out of this handy piece of power-calculating software (also free, check it out!) 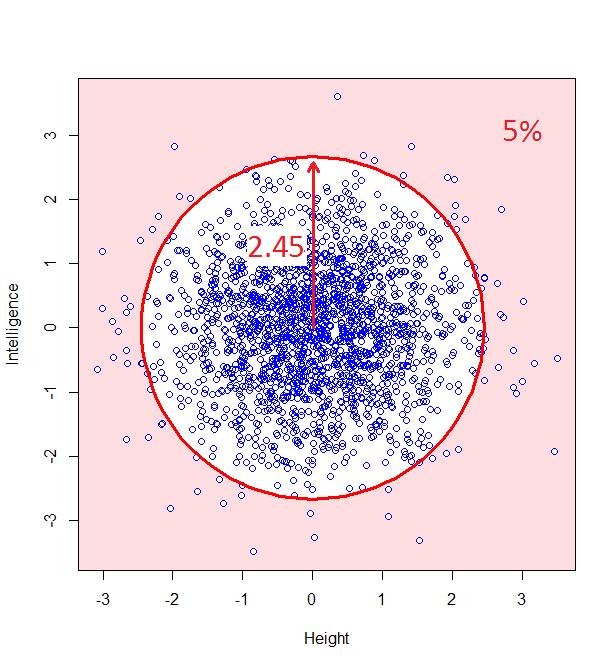 The effect size is a Cohen’s d, which is just the distance of the true mean from the null hypothesis mean, divided by the population standard deviation: in our case that is . All the other numbers in this output should now make perfect sense to you! And, phew, G*Power agrees with our computed power. 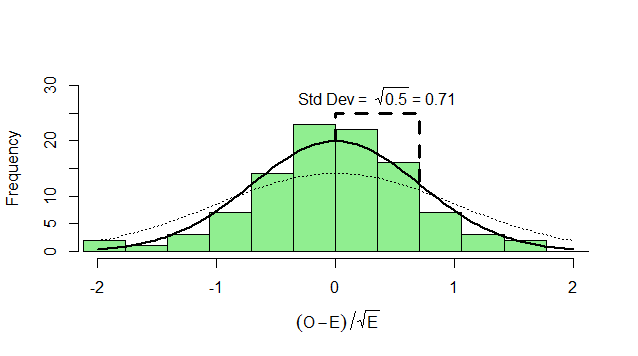 In my last post, I talked about how sample means tend to be normally distributed, but if we divide them by their sample standard deviation they are t-distributed. That post was really written as a supporting post for this one, and I’ll assume that you have read that post or understand these things already. Here I’ll show you a little experiment that will give you a pretty good idea of exactly how the -distribution gets its shape. Since a distribution is like a “pile” of probability mass for any given score, we can combine all these possibilities by piling each pile on top of the other, and this is what I have done in the bottom graph above. 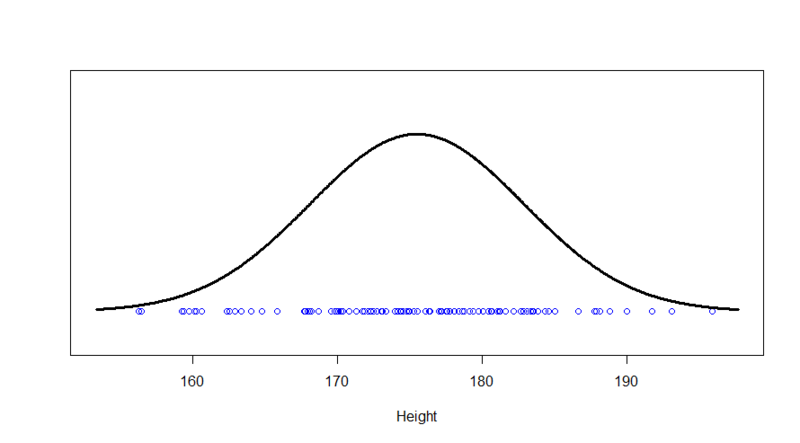 The thick black line represents the top of the pile, the sum of all three of our normal distributions. The red line is a -distribution. It’s pretty close, though not exactly right–and that’s because I’m approximating by saying it will be only one of three possibilities: there are many different shades of “too high” or “too low”. But this should give you a decent idea of how the t-distribution gets its shape. The grey-shaded region is the normal distribution, which you can see is quite a different shape. Since we’re adding up a bunch of normal distributions that all look very similar, it’s no surprise that what we get at the end is something that looks like a normal distribution: the thick black and red lines both match the grey shaded normal distribution pretty closely. 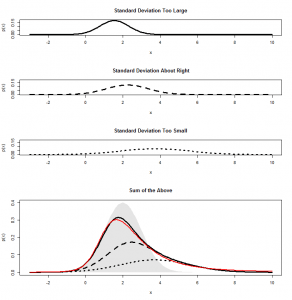 The goal of this post is to show you that a t-distribution is just a pile of different normal distributions with different spreads. And, in fact, one way to derive the shape of the t-distribution is to add up the infinite number of different normal distributions that we could get for every different “wrong” standard deviation that we could get. 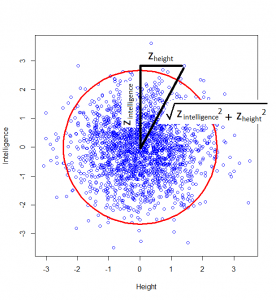 What is the difference between a z-test and a t-test? so the standard deviation of the above normal distribution should be , which looks about right for the above histogram! And we can compare these numbers to the numbers in our z-tables in our statistics books. 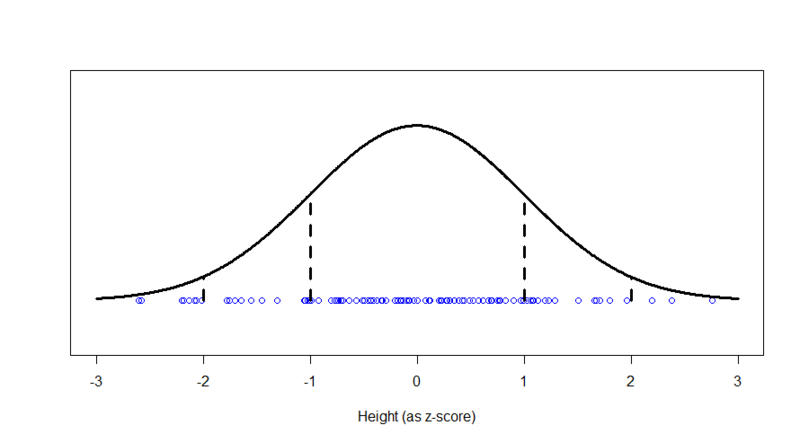 We can see that, for example, getting a mean of 28 or more has only a 2.5% probability — because it has a z-score of . This also agrees with the histogram of means, where we can see there were not very many cases above 28. This is a -test, and we run a -test when we know what the true standard deviation of the population is. The black line that I’ve fitted to this histogram is the -distribution with three degrees of freedom. (Three because degrees of freedom is ). You can see it is fatter at the edges; we saw that there was only a 2.5% chance of getting a -score of 2 or more, but there is a 7% chance of getting a -score of 2 or more in this case. 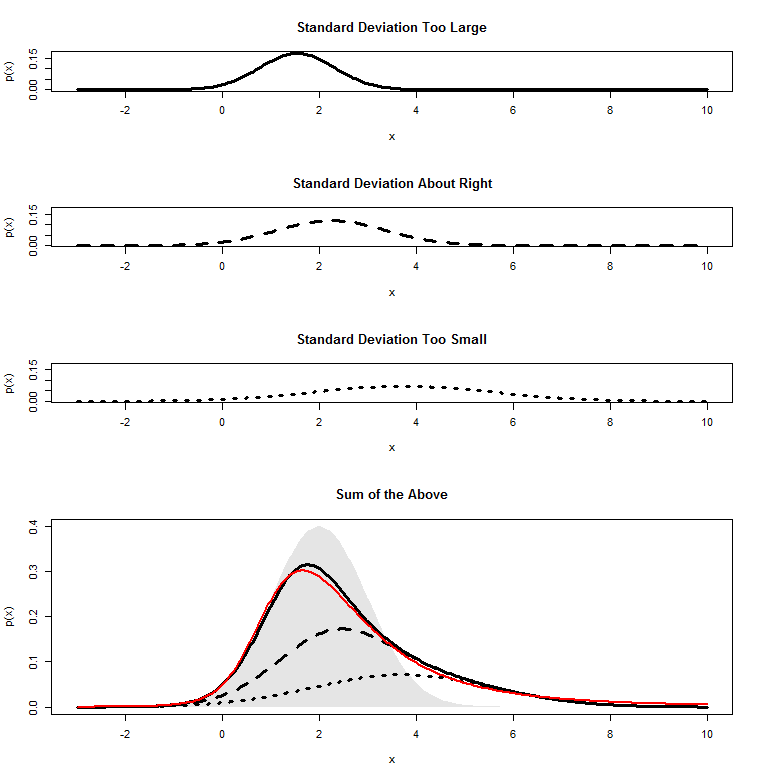 So, if we don’t know what the true population standard deviation is, we can use our sample standard deviation as an estimate, but we need to compare it against a different distribution (the -distribution), which means looking at a different table in the back of your statistics book (a table referring to “ “), and we call it a “ -test”. If you’re curious where the shape of this distribution comes from, my next post should give you a pretty good idea of it. 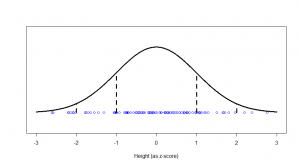 Wilks’ Theorem: Why do likelihood ratio tests work? This is a question I’ve wanted to understand for quite some time. 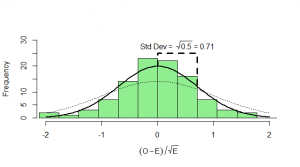 The likelihood ratio test seems to be almost a silver bullet for many of the modern maximum-likelihood approaches to statistics, but it always seemed quite mysterious to me that should have a known distribution. I’ve spent my morning today working through a few derivations for this, and it’s some dense stuff! I haven’t yet looked at the full multi-dimensional proofs, so I am no expert by any means, but I have managed to get my head around the proof of a simplified Wilks’ theorem here, and what follows is a little summary of this, partly for my own reference, and partly because I’d have found a simple overview helpful before I looked at the proper proofs, so I hope it might be helpful someone else too. Clearly, I’m no expert on this particular topic, and I’d welcome any corrections or suggested improvements. If you don’t know what a likelihood ratio test is, or what maximum likelihood is, I refer you to Google! There is plenty of stuff out there on what they are and how they are run. What I found harder to find, however, was anything offering a simple, crude intuition of why it works. So, I thought, now that I have my head around a simple version of the derivation, it might be nice to make a quick, simple graphical summary. I gloss over a lot of technical details about different types of convergence etc here. This is just the bare bones. The gap between the dashed lines represents the log likelihood ratio `LR’, and we are using here a Taylor expansion to find this difference in log values (i.e. log of a ratio). Bear in mind that since we are at a maximum on the likelihood surface; this is why there is no linear term in our expansion. The key to the proof is the claim in the underbrace, that will be normally distributed around , with variance of . If we can prove that this is true, then we are done: it is clear, in this case that . Though, that does assume that the curvature in the log likelihood surface for our data is close to its expectation. 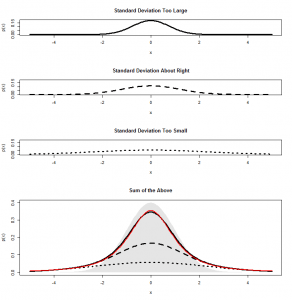 Since we now have a straight line, then if we can show that is normally distributed, then so too should be . And, indeed, the log likelihood is found by summing the log likelihoods across all datapoints, each of which is i.i.d., so central limit theorem gives us that it is (asymptotically) normally distributed, and so too should be its derivative . Here, as in a couple of places, we are treating as if it behaves like a constant , while we are treating as a random variable. This relates to Slutsky’s theorem, which I won’t go into here, but a simple way to view this is that so, as numerator and denominator above get closer to their expectations, the variance is really driven by .